For the first time in a practice open to the media on Tuesday, kickers Mason Crosby and Giorgio Tavecchio competed head-to-head with dueling field goals. Both kickers went 3-for-3, hitting from 38, 43 and 50 yards, all with plenty to spare. Leg strength has never been an issue with Crosby, and it doesn’t appear to be with Tavecchio either. Later in practice, the offense went against the defense in a 7-on-7, two-minute drill. With the first units on the field, QB Aaron Rodgers hit WR James Jones down the seam inside the 5-yard line and then capped it off with a TD pass to WR Randall Cobb on a quick in route. Then with the twos, QB Graham Harrell twice hit undrafted rookie WR Myles White to convert fourth downs and keep the drive alive. The second came moments after CB Loyce Means nearly got an interception to win the drill for the defense. Harrell then finished the drive with a TD pass to TE Brandon Bostick, who made a nice diving catch at the pylon. Graham Harrell locked up the backup QB job with a stellar outing on Thursday against Kansas City (13 of 15, 223 yards, 2 TDs, 158.3 rating), and GM Ted Thompson said on Saturday what stood out about his performance was the plays he made with his feet. “You could see his ability to ad-lib a little bit, which is a huge thing playing quarterback in the NFL,” Thompson said. “Obviously some guys made some plays for him down the field, and I thought we protected pretty decent. It was a good showing. One of the close calls in the roster cutdown that Thompson mentioned was the sixth and final spot on the defensive line. It went to Phillip Merling, a 6-5, 315-pound end who was a former second-round draft pick of the Dolphins, over Daniel Muir, a 6-2, 322-pound nose tackle who had made the Packers’ roster as an undrafted rookie back in 2007 before playing four seasons in Indianapolis. “In the case of Daniel Muir, very difficult. Very passionate young man,” Thompson said. “But the NFL is like a wheel, it goes round and round, you never know when someone might be back. That decision was one of many difficult ones, Thompson said. Without naming the player, he told the story of one player who was released on Friday who told Thompson what a thrill it was to simply play a preseason game in front of the Lambeau Field crowd. There’s been nothing fun about these last couple of days for Thompson, though, who has often said that roster cutdown days are the worst days of his job. “We had a fairly strong 90-man roster I felt,” he said. “These guys competed and played hard, and eventually you have to cut down. It’s just awful, the experience of going through that. For the main story from Thompson’s Saturday press conference, click here. The Packers concluded their preseason with a 24-3 victory over the Kansas City Chiefs that left the Packers at 2-2 and their fans feeling a whole lot better about backup quarterback Graham Harrell. Harrell rebounded from a slow start to the preseason by completing 13 of 15 passes for 223 yards, two touchdowns and no interceptions. He relieved Aaron Rodgers with the Chiefs leading, 3-0. Rodgers and the Packers No. 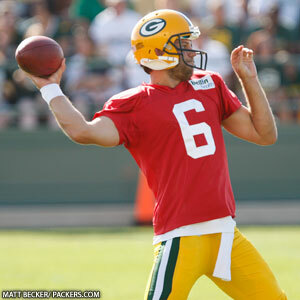 1 offense played briefly, as Rodgers threw only two passes, completing one for five yards. Cedric Benson was the Packers starting running back and he rushed four times for 11 yards. It was the Packers No. 2 offense that turned the game into the home team’s favor. Harrell teamed with second-year wide receiver Tori Gurley on a deep pass to the one-yard line, and Alex Green scored on a two-yard run. Later in the second quarter, Green scored on a perfectly executed screen play that covered 17 yards and gave the Packers a 14-3 lead at halftime. A 12-yard Harrell to Jarrett Boykin touchdown pass in the third quarter gave the Packers a comfortable 21-3 lead and capped Harrell’s night. He celebrated his performance with a fist pump following the touchdown pass to Boykin. It was a gesture that released a lot of frustration that had built up through the first three preseason games. Several players considered to be on the roster bubble played well for the Packers, which will further complicate General Manager Ted Thompson’s decisions on Friday, when Thompson must reduce the roster from 75 to 53. The rookie Boykin led the Packers with five receptions, but Gurley and Diondre Borel, holdovers from last year’s practice squad, each caught two passes and made moves on earning a roster spot. Defensively, the Packers allowed more than 200 yards rushing, but they made two goal-line stands, one resulting in a Sam Shields interception, and pressured Chiefs quarterbacks. Erik Walden capped a great preseason with a sack. In his weekly training camp briefing with reporters on Tuesday, Packers GM Ted Thompson was asked what he’d like to see from Graham Harrell in the third preseason game, and Thompson acknowledged that a backup QB doesn’t have it easy in the preseason. “Just continued improvement,” Thompson said. “There’s been a lot of criticism. I think Mike mentioned he graded out much better than you might expect. It’s not always easy during the second half of a preseason game and the chaos is coming at you pretty good. Thompson and the Packers must make the first mandated roster reduction of the preseason by Monday, trimming the roster from 90 to 75 players. The final roster cut, to 53 players, is after the fourth preseason game. Thompson has spoken often in the past about how much he dislikes releasing players, particularly because he entered the league as an undrafted free agent and was always on edge at cutdown time. Thompson managed to survive and put together a 10-year career in the league, but he knows that’s the exception, particularly for undrafted players. That said, Thompson added that he liked the offseason roster expansion from 80 to 90 players this year, even if it means more hard decisions down the road. Tuesday’s practice marked the second straight day QB Aaron Rodgers led the first-team offense down the field for a score during the two-minute drill. A day earlier, backup QB Graham Harrell didn’t get an opportunity with the second unit. On Tuesday, he did, and he succeeded as well. Needing a touchdown with 1:54 on the clock and two timeouts, Harrell drove the offense 60 yards to paydirt. The big play was a 24-yard completion to TE D.J. Williams on a middle seam route that put the ball in the red zone. Three plays later, Harrell fired a back-shoulder throw to WR Tori Gurley, who was covered tightly by CB Sam Shields. Gurley made the adjustment on the ball, juggled it, and hauled it in as he was falling to the ground for a 10-yard TD with 34 seconds left. Harrell first showed his cool in those pressure situations last summer in the third preseason game in Indianapolis. As the No. 3 QB, Harrell drove the Packers 73 yards for a TD and 2-point conversion that tied the game with 35 seconds left. He completed seven of nine throws on the drive and threw for the 2-pointer. Following a successful onside kick, he completed two more passes for 20 yards to set up the game-winning FG. –The team practiced 2-point conversion plays for the first time in camp on Tuesday. Last season, the Packers attempted just one two-point play on offense, but had to defend six tries on defense. The Packers went 0-for-1 while their opponents went 4-for-6 in 2011. –Wednesday will mark the final of six straight 8:15 a.m. practices. Beginning on Thursday, practices will be held either at 7 p.m. (with Friday’s Family Night scrimmage at 6:30 p.m.) or 3:30 p.m. for the next two weeks. Following the second preseason game, practices shift to late morning, beginning at either 11:15 a.m. or 11 a.m.
New Packers center Jeff Saturday used the phrase, “Make no bones about it.” He chose Green Bay in free agency because he wants to win another title. Entering his 14th season, Saturday went to two Super Bowls with the Colts, winning one. He’s now working with his second MVP quarterback in Aaron Rodgers after snapping to Peyton Manning in Indianapolis for roughly a decade. “I tell them, those guys are awfully lucky to have me as a center,” Saturday said, tongue firmly planted in cheek. “No, I’m just kdding. It’s incredible. How blessed can you be, right? You go from MVP to MVP, and both guys are well-deserving. “I keep telling him, you have to try all these things, and once you get them, they help you go a long way,” Saturday said. “They look really good in a game. When you practice them against the same guy every day, it may not look as good. But you get accustomed to doing them in the game and they’re going to make you a better player. Elsewhere on offense, WR Tori Gurley continues to get opportunities to use his 6-4, 232-pound frame on jump balls. The QBs gave him repeated tries at an end-zone/corner-fade, and he came down with the first two. The first one was in a one-on-one drill against CB Casey Hayward, and after the catch, Rodgers encouraged Gurley to celebrate with the crowd. Call it a “Nitschke Leap” for Ray Nitschke Field, but the crowd was eating it up. “I’m just having fun,” Gurley said. “I see how (Donald) Driver gets the crowd going, so I was like, you know what, I can do the same myself. Every time I catch a ball, I just wink at somebody and enjoy myself. Gurley’s other jump-ball TD came over CB Otis Merrill in an 11-on-11 red-zone period. In a later red-zone team period, QB Graham Harrell tried to go up top to Gurley, but CB Davon House played the ball well and kept it from Gurley’s grasp. – “These young guys have added a lot of energy. 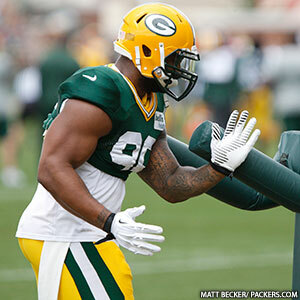 It’ll be exciting to see them in pads,” McCarthy said of the team’s draft picks, the first six of which are defensive players.